ABSTRACT: Breeding ranges of some weavers are changing in arid areas of southern Africa. 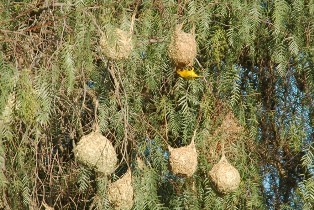 To study these changes, a new citizen science project called PHOWN (PHOtos of Weaver Nests) has been running for a year. PHOWN is one of the ADU Virtual Museum projects and allows the study of breeding distribution, colony sizes, and breeding seasonality in weavers. The southern limit of Sociable Weavers has not changed in 20 years. Southern Masked Weavers have expanded their range into western South Africa over the last 100 years. Average colony sizes of Southern Masked Weavers are double as large in the Northern Cape (1-10.0-65, n=56) compared to the Western Cape (1-5.2-45, n=121), probably due to breeding at sites with concentrated sources of food and nesting material in more arid regions. Of particular interest will be monitoring future breeding seasonality and colony sizes of weavers in arid regions by involving birders and farmers, and comparing the data to changing rainfall patterns. Also being in Nieuwoudtville allowed the opportunity to collect many PHOWN records in the area - see here.